A report from Amanda Walker, one of our corresondents in Zürich, with news of a seasonal product promotion at McDonald’s. It’s gooey cheese time again! It’s back, and available only in Switzerland. 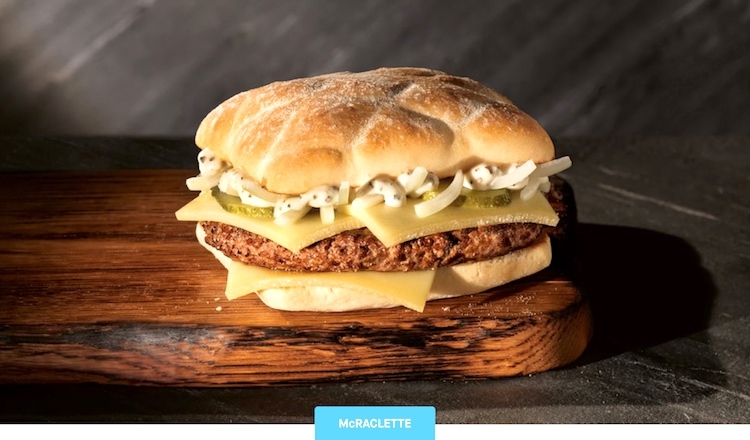 McDonald’s Switzerland recently launched their Winter Weeks food promotion introducing the new McBretzel alongside a returning Swiss favorite the McRaclette. Developed in collaboration with Chef Roman Okle from the famous Swiss cheese company Emmi and the 2015 captain of the Swiss national cooking team, the McBretzel was created using the typical Swiss ingredients and designed to ward off the cold that inevitably comes at this time of year. Crafted with succulent Swiss beef, two spicy Emmi cheese slices, hot mustard chutney, rocket salad, onions and a spicy house sauce, all held together with the popular lye roll [made by immersing a bread roll in a lye solution before baking]. The returning favorite McRaclette is the modern take on the classic Swiss dish raclette and a popular former menu item. Traditionally, raclette is a wheel of cheese served heated to spread on food, but McDonald’s Switzerland decided to reinvent the raclette wheel and produce their own version. The [sandwich] contains Swiss beef and three Emmi raclette cheese slices as well as [pickles, onions, and raclette sauce on a ciabatta bun], and is already one of the most popular sandwiches with Swiss customers. Raclette is a semi-hard cheese that is usually fashioned into a wheel of about 6 kg (13 lb). The Alpine cow milk based dairy product is most commonly used for melting, but is also consumed as a slice. Raclette is a Savoyard (French) as well as Swiss dish based on heating the cheese and scraping off (from French: racler) the melted part. Raclette was mentioned in medieval texts from Swiss-German convents dating from as early as 1291. The cheese was originally consumed by peasants in the mountainous Alpine regions of Valais (Switzerland), Savoie and Haute-Savoie (France). It was then known in the German-speaking part of Switzerland as Bratchäs, or “roasted cheese”. Traditionally, cow herders carried cheese with them when they were moving cows to or from pastures up in the mountains. In the evening, the cheese would be placed next to a campfire for softening, then scraped onto bread. 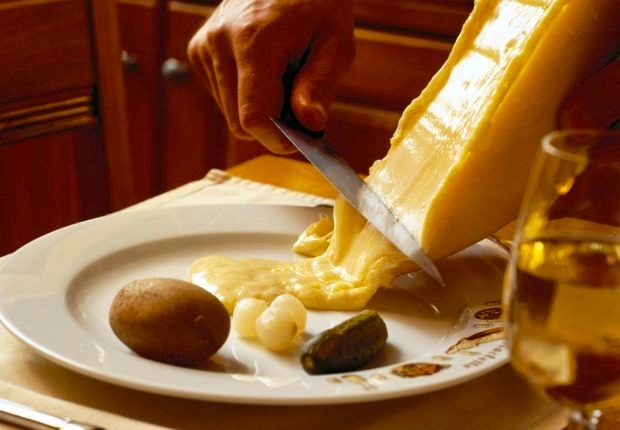 In Switzerland raclette is typically served with tea, other warm beverages, or Fendant wine. A French popular option is to serve it with white wine, such as the traditional Savoy wine, but Riesling and pinot gris are also common. … In Switzerland, a scraper continuously serves all in the restaurant from an oven placed in a separated table or near a wood fire. In France, restaurateurs often place a raclette oven directly on the table. In that case, the scraping is to be done by the guests. … Traditionally the melting happens in front of an open fire, with the big piece of cheese facing the heat. One then regularly scrapes off the melting side. … It is accompanied by small firm potatoes (Bintje, Charlotte or Raclette varieties), cornichons (gherkins), pickled onions, and dried meat, such as jambon cru [cured ham, prosciutto] / cuit [cooked ham], salami, and viande des Grisons [Bünderfleisch, air-dried beef], and to drink, Kirsch [morello cherry brandy], herbal tea or white wine from a swiss vineyard a Fendant (wine from the Chasselas grape). 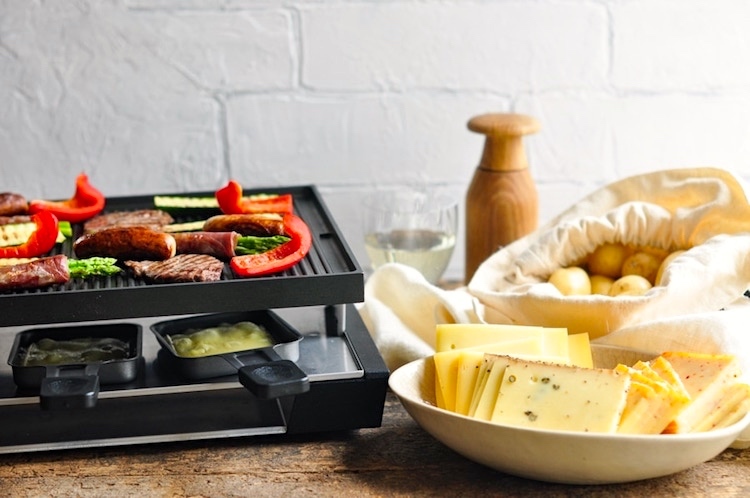 A modern way of serving raclette involves an electric table-top grill with small pans, known as coupelles, in which to melt slices of raclette cheese. This new way [has been] used since the 1950s. Generally the grill is surmounted by a hot plate or griddle. In Switzerland the electrical raclette is called “raclonette”. The device is put in the middle of the table. The cheese is brought to the table sliced, accompanied by platters of boiled or steamed potatoes, other vegetables and charcuterie. These are then mixed with potatoes and topped with cheese in the small wedge-shaped coupelles that are placed under the grill to melt and brown the cheese. Alternatively, slices of cheese may be melted and simply poured over food on the plate. The emphasis in raclette dining is on relaxed and sociable eating and drinking, the meal often running to several hours. French and other European supermarkets generally stock both the grill apparatus and ready-sliced cheese and charcuterie selections, especially around Christmas. Restaurants also provide raclette evenings for parties or dinners. 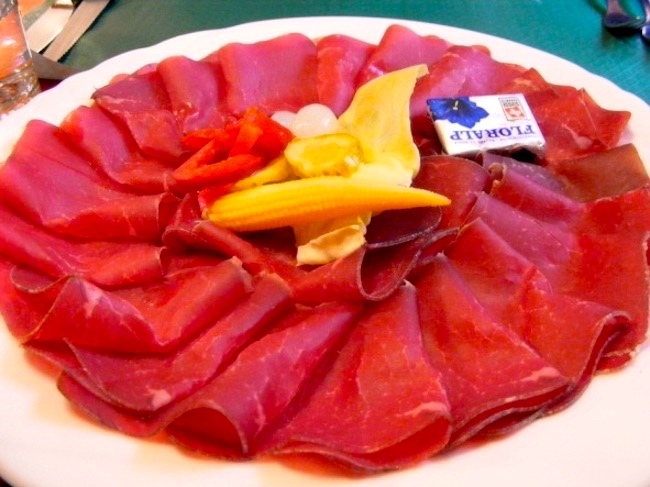 Bündnerfleisch, also known as Bindenfleisch or Viande des Grisons, is an air-dried meat that is produced in the canton of Graubünden, Switzerland. The main ingredient is beef, taken from the animal’s upper thigh or shoulder, the fat and the sinews being removed. Before drying, the meat is treated with white wine and seasonings such as salt, onion and assorted herbs. The initial curing process, lasting 3 – 5 weeks, takes place in sealed containers stored at a temperature close to freezing point. The meat is regularly rearranged during this stage, in order to ensure that the salt and seasonings will be evenly distributed and absorbed. During a second drying phase the meat is then hung in free-flowing air at a temperature of between 9 and 14 °C. It is also periodically pressed in order to separate out residual moisture: from this pressing Bündnerfleisch acquires its characteristic rectangular shape. Traditionally Bündnerfleisch was not a smoked meat. … Bündnerfleisch is served with bread, sliced very thinly. It is often part of the traditional dish raclette, served to accompany the cheese of the same name alongside ham and vegetables. It can also be served in soup, cut into strips or little cubes. (As far as I know, McDonald’s Switzerand doesn’t offer McBündnerfleisch.) And that’s today’s food news from Switzerland. This entry was posted on December 2, 2018 at 12:08 pm and is filed under Language and food, Names, Switzerland and Swiss things. You can follow any responses to this entry through the RSS 2.0 feed. You can leave a response, or trackback from your own site.